The windshield is an essential component of your vehicle. Just imagine how uncomfortable it would be to drive down the highway without one in the middle of winter. Your windshield protects you from flying debris, helps manage the interior temperature of your vehicle and provides a clear view of the scenery. Your windshield is so important that you need to ensure it is not damaged in any way. Nothing makes you pay more attention to your windshield than chips, cracks and other defects. Your windshield is exposed and can be damaged in any number of ways. For example, a foul ball at the little league ballpark could damage your windshield. Suffolk Auto Glass, your windshield repair service in Long Island, offers a few common causes of windshield damage. Hailstorms are a common cause of windshield damage, especially when the hail is the size of golf balls. But other types of storms can cause damage as well. A storm that produces high winds could blow tree branches and other debris into your windshield and cause damage. Protect your windshield by parking your car in a place that offers at least some protection from the elements. A small chip in your window caused by a rock might be annoying, but isn’t cause for major concern. That is, until it starts to deepen and spread over time. Most rock chips are the result of gravel and other road debris that gets kicked up onto your windshield. You would be wise to keep your distance behind larger vehicles that you know could be carrying big loads. The glass in your windshield is very strong. However, it can develop stress fractures in certain conditions, including temperature and extreme pressure changes. If you choose your windshield replacement service poorly, you could wind up with a low-quality windshield subject to manufacturing defects. These defects might not be visible right away, but very small cracks in your new windshield can become large cracks over time. The same seedy windshield repair service that sold you cheap glass may also not know how to properly install your windshield. Incorrect windshield installation can leave you with a loose fit, which leads to a high level of vibration that could leave cracks. It is very important that you have your windshield replacement handles by a reputable company. Your windshield was designed to hold up to extreme heat and cold. However, your windshield could become damaged when exposed to sudden temperature shifts. Not to worry too much though, it takes years of sudden temperature changes before damage will occur. It’s not like your windshield will crack on the day when it goes from 25 degrees to 65 degrees in a few hours. A broken windshield caused by an accident might seem very obvious, but this is not always the case. You could have a fender bender that bends the frame that holds your windshield. This would put excessive pressure on the glass and could cause cracking. It is best that you have your windshield examined even after a minor accident. 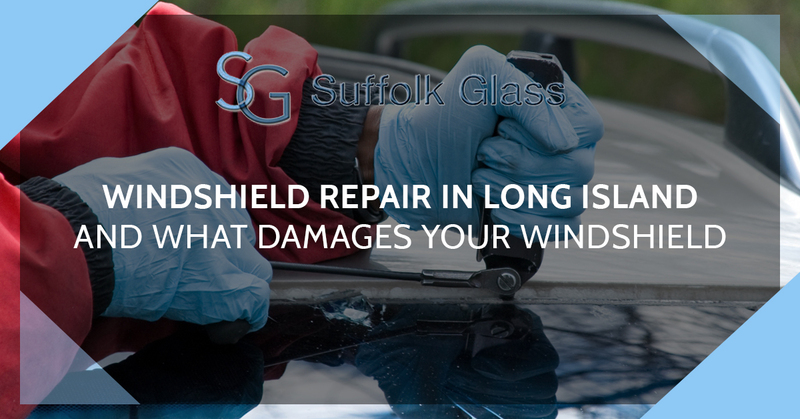 For windshield repair and replacement, contact Suffolk Auto Glass today.